Snowbound in the Yukon: Quiet time. All the children are sleeping. Shhh, don't wake them. I hope the tap tap tap of the key board doesn't wake them. They are angels when they sleep, soft limp bodies, butterfly eyelashes resting on cheeks. Why wasn't I that lucky to get those eyelashes and all three of them have them. Lucky lil'devils. I can hear one of them breathing, probably because they can't breath through their noses, kinda like me right now. The tail end of the nasty cold we've been suffering with. 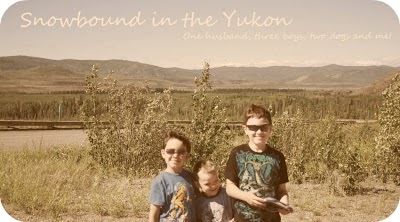 It's been an interesting week, all three boys all to myself with no daddy around. In some ways it's been nice, they seem easier but I think it's because I know I have to deal with everything they through at me. I can't rely on hubby to come home and deal since he's 500 and some kilometers away right now but he's flying home tomorrow and we've all missed him. We talked on the phone tonight and I know he's anxious to get home too. The two oldest really miss him and after talking on the phone Little M keep making the sign for plane and saying da-da. He's really making more efforts to communicate these days and I'm encouraging him as much as I can. Time and patience is all it will take. They were finally asleep by about 9:45 and I called Hubby back so I could talk to him. I haven't gone insane this week but I have been having cigarettes at night and I know I should stop now or it won't stop. I'm really trying but when I'm stress it's either eat or smoke or both and right now it's both. I haven't walked in a week but luckily for me I haven't put on any weight but my hip has started bothering me again. I really have to lay off the M&M's. My gosh those are addictive. We did manage to clean up the back yard a bit I have a big pile of trash by the side of the road waiting for Hubby's truck to haul it away. We picked up toys and SmartGuy moved all the big toys to one area and made himself a little classroom. SmartGuy is officially out of school as of yesterday and we noted on his report card that he would be moving onto Grade 1 next year. It's really hard to belive how quickly they grow up. His behavior as improved but only back to what is was ages ago. He's still 5 years old and still does 5 year old things. I'll take what I can get and keep working on it. I think in the morning I will take them to the park since Romp'n'run is now over, since it's summer. Hopefully there will be other mother's there and other children for the little ones to play with. We went to the school park today so they could burn off some energy, it seems to have helped. I'm hoping that starting Monday I will have a better schedule for the days. It will be a busy summer. Art camps starts soon and the sign said for 6-9 or something like that. I was bummed but I'll call and see anyway if they'll take an almost 6 year old. It's for 3 afternoons a week and it would really help me because I know SmartGuy will need breaks from his brothers and I. The pool opens tomorrow as well and there is a free swim. I'll have to sign SmartGuy up for lessons as well. I'm wondering what I should do for Little M. I guess it begins now where I will be enrolling two boys into activities and the expenses will go up. I signed up for it though having more than one child. I do love my boys.